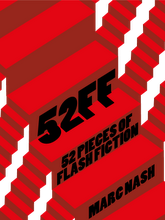 Home / Genre: Anthology / Genre: Flash Fiction / Marc Nash / INTERVIEW: With Marc Nash athor of a story a week "52 FF"
INTERVIEW: With Marc Nash athor of a story a week "52 FF"
Thank you very much for returning to AR and agreeing to be interviewed. I promise I'll be gentle with you! I'll start by asking for a brief synopsis of your latest book? MN: It's an anthology of 52 pieces of my flash fiction, stories of 1000 words or less. SB: Define flash fiction and why you chose to go down this route with your latest publication. MN: When my debut novel first came out, I said I wouldn't write anything new for 6 months as I would concentrate on marketing it. I'd recently joined Twitter and found a flash fiction writing community under the #fridayflash hashtag and started contributing to it as part of introducing myself as a writer. I wrote a new story every week for a whole year and just beyond. With some 60 stories I realised I had enough for an anthology so took the best 52 and published them. From a decision not to write anything new, I emerged with a completely new book! SB: Well done! It's a great idea. I have to say I am a fan of flash fiction and saving the short story. I encourage it on my Sunday meme, the Sassy Sunday Story Starter (LOL) and believe having a small word count for a story helps to only choose the words that really matter, so all the unnecessary words are chopped out and the prose is much tighter. MN: I agree, but despite the constraint, I actually found it liberating. I could take the central theme or metaphor and come at it from every direction within 1000 words. It was like looking at something under a microscope. Oh, nicely put! Yes, that is what makes flash so fun. You never know where it's going to take you. Where did you learn, or practise your flash fiction writing? MN: Until joining that Twitter community I'd never written a flash story in my life. 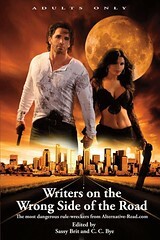 I'd barely written short stories as novels were always my chosen form for fiction. But writing is writing and although 1000 words is a discipline that calls for a different approach, it was my love of language and its precision that let me explore the short form. You just don't have time or words to waste in flash, so it calls for a real exactitude in word choice and an economy in how you communicate an idea. It brings metaphor and image to the forefront and I love that. For me each story has to have a stunning metaphor or idea at its heart and that was the challenge in doing 52 of them. SB: Well, you've done very well, Marc. Twitter is such a great place, too! What advice would you give to anyone wanting to try this form of creative writing out themselves? MN: Just go for it! I'm not trained. I've attended no courses. Read no "How To" books. Just trust your instincts and of course, read the works of others. I think the only key is to work out why you want to write; what words, language and story-telling mean to you. Then you can feed this in to your approach to flash. SB: Very inspiring! Have you any flash fiction sites you can recommend to our readers? MN: It's not a site but a portal to the blogs and websites where writers post their work and that's the #fridayflash hashtag on Twitter. Follow that and click on the links to stories that are tweeted on Fridays. Fictionaut is a good short story site, though not exclusively flash fiction. SB: Which flash fiction writers inspire you? MN:There are many flash writers I met through twitter who do the most brilliant work, Carrie Clevenger, Alison Wells, Penny Goring, DJ Young, Tony Noland, Linda Simoni Wistila, Lisa Vooght, Cat Del Rio. But it's a fairly fluid community and many of these are probably not writing flash right now as they've moved on to novels. Just follow the hashtag and see who you can discover! SB: Sounds like some interesting writers to check out and a very busy community. Thanks! So, do you ever get writer’s block? If so, what do you do to overcome it? MN: Gosh no. I am always behind all the material I've got, so I'm forever playing catch up and don't have time to get blocked. If something isn't working, rather than stew with it, I just move on to something else and come back when the block is removed, but that doesn't happen very often. I usually build up a head of steam before writing a new project and the momentum lets me surge into the project. "52FF" was an entirely different experience, because there I was writing one story a week, although some weeks towards the end I was actually writing 2 or 3. But it was a constant writing process, rather than a flat out approach I use when writing longer works. SB: What is your most treasured possession? MN: That's a very good question. I'm not a great hoarder. I don't keep things and get them out to look at them. I'm not sure I have one. I'd be lost without my laptop though! SB: To whom would you most like to say sorry, and why? SB: Who would play you in the film of your life? MN: For some reason I've always considered this question, even though I'd run a mile were it ever to happen and my life really isn't that interesting enough to film. But, I'd always settled on Martin Sheen (not Charlie) because he's a great actor, but the American accent might be a problem. If that was the case, then I'd plump for David Thewlis. I like his edge. SB: I love the actor David Thewlis. He has my vote! So, who would write the script? MN: Samuel Beckett (I wish). I'd like to think I approach his absurdist view of the world, but he'd almost certainly have shrugged his shoulders when approached with the offer of the job! Actually, he'd probably not even do that. Just look straight through the Producer with those piercing blue eyes and wrinkled face like a Zen Master, until the Producer figured out the answer was 'no'. SB: Great answer! If you could realise a dream that you have had whilst asleep, what dream would you pick? SB: I have had those types of dreams, too! LOL Suddenly we can't remember where we live and if we do we just cannot get there! It's been great talking to you again, Marc. Where can our readers find out more about your writing? MN: My blog where all these stories first appeared is www.sulcicollective.com I have two websites dedicated to my two novels, http://marcnash.weebly.com & http://marcnashNIMN.weebly.com but the best way to keep up is just to follow me on Twitter @21stCscribe. I'm er pretty active there! SB: I think a book of your flash fiction is a great idea. What’s your next project going to be? MN: I've got two on the go. A book about fathers and sons which is currently with a designer to develop some modern majuscules (those beautifully drawn and coloured giant letters at the head of chapters/pages of illuminated old manuscripts). And right now I'm writing a novel about observation and physics, with the main character being a private investigator who spies on cheating spouses! SB: Thank you so much for taking the time to answer my questions. It’s great to have you back and I wish you well with the new year and all the brilliant writing opportunities this will bring you. MN: Thank you and I hope you have a brilliant 2012 and Alt Read goes from further strength to further strength. Book Trailer for "Not In My Name"